Cabrita Hills Farm, located in the rolling hills of northeastern Alberta, Canada, raises meat goats on 320 acres of heavily treed land. We currently run a herd of about 500 goats that are bred to thrive in our harsh northern Alberta climate. easy kidding (we didn't help with a single birth of our 242 kids in May 2017). We sleep through the nights during kidding season! hybrid vigor, with lively kids that are up and sucking often before their twin is born. They are born knowing where the teat is and what it is for. No more trying to coax kids to nurse. excellent mothering. Our mothers know how to look after their kids. They stay together, move as a herd, bring their kids home at weaning. hardiness and easy keeping. Our goats are out in the bush and pastures - using the trees and lay of the land as windbreaks. In 1999 we purchased 10 Boer x Dairy cross does, 6 pb Spanish does and a reg. Boer buck. After adding Boer bucks to our herd for several years, we acquired Sultan , a pb Spanish buck in 2004 to improve winter coats, mothering and add hybrid vigor. In 2013 we imported 3 more pb Spanish bucks to provide new Spanish genetics to our herd. 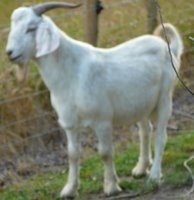 We liked what we read about Kikos (developed from feral New Zealand goats) and in 2006 we added two young Kiko bucks from GUL lines as herd sires. kikogoats We were so impressed by our Kiko cross kids born in 2007 that we used only our 2 Kiko bucks to breed ALL of our does in December 2007. Our 2008 half-Kiko kid crop convinced us that we made the right decision. It was the best kidding season we'd ever had. We had 148 kids born during the first 14 days of kidding - all sired by our two busy Kikos! The kids were up and running within minutes of birth, stuck closely to their dams, were intelligent and are grew quickly. T29, half Kiko-half Boer buck weighing 103 pounds at 13 months. In 2008, we purchased an AKGA Kiko buck out of Confederate / Generator / Moneymaker lines and another Kiko buck from Manitoba to breed to our half-Kiko Cabrita Hills doelings. In 2009 we added 2 new Kiko bucks that were born in the States - out of Moneymaker / Generator / Goldmine / Goliath lines. In 2016 we added 3 more Kiko bucks out of Lookout Point Ranch (Caprinex) and Quebec genetics. We replaced our Boer genetics with three Savannah bucks from premier herds in 2009, 2011 and 2013. They have been bred to many of our Kiko and Spanish x does, and have added size and more good mothering to our herd. Since we live in "coyote, bear and lynx country "(with occasional wolf visits), our goat herd is divided into 5 widely separated groups that are guarded by 12 Maremma Livestock Guardian Dogs. 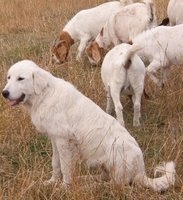 Brita, at 6 months, guarding her goats. Brita at 11.5 years old still actively guarding does in the snow. Kids on the north side of one of our dugouts. 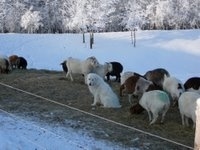 Our dogs and goats enjoy the snow when they have a bed of straw to lounge on.